My first blogging birthday is in 23 days… I’m saying “wow”, I’m saying “I made it” and “high 5’s” to you because someone’s actually reading this. I always try to stretch my birthday out for the week, why not? So if you’re a blog why not try a month! June is now Bling and Butterflies Birthday month. Presents are always fun, so why not a prize for one of you! I’m excited because it’s one I’m loving at the moment, from VS Sassoon and courtesy of Drop Dead Gorgeous Daily. I have some great info about that later in the week. In the meantime, thank you for reading when you have time, you know who you are! You’ve given me the encouragement I needed from your emails, in your comments and even in the street. Puts a great big smile on my face and makes it so worth while. I remember reading somewhere in the early days, many bloggers will give up after the first 3 months and hoping that wouldn’t be me. If I’m honest, then yes that was nearly me… for a couple of reasons. It takes a lot of time to get this blog into gear. The writing’s the easy part. The photography’s the fun part. The editing of the both is ok. But it’s the technology and inexperience of the entire concept that takes so much of my spare time. Don’t get me wrong I love it. I just wish I knew it all and now! I feel myself being torn in different directions to research, to photograph, to schedule. But then I find myself having to be a mum and a wife and lately a part time friend, daughter and sister. Yes there are excuses, yes there was a relapse of glandular fever and the little one vomited through the entire house but the desire to keep blogging was still there. Just in the background. It’s hard to find a balance when you become so passionate about something. For years I’ve given myself to my family. You know the drill, you work as hard as you can in whatever role you have. Be it a stay at home parent, you work part time or go the whole hog and work full time. Whatever your role, it’s difficult to let yourself do something for you in the hope it will eventually benefit your family over time. Then, in the early days one of my blog posts was nabbed by a well known blogger and part of it regurgitated as her own… discouraged, disgusted and heartbroken. I felt sick and angry and couldn’t go near my blog for a week or so. Being a newbie I didn’t know what to do. I hid my head as far away from the computer and blogging world as I could. Eventually I picked myself up and decided I had to either throw the digital towel in and be done with it or push on and put it in my past. I decided karma would deal with her and I would deal with myself. There’s no reason to let someone make me feel like that or get in the way of my new found dream. How do you do it all? Or do you only get some things done, half of the time… like me! I love lists and schedules, these are a life saver for my family. But sometimes life just doesn’t want to conform to our scheduled desires. And that’s ok. We are ok. We do what we can, when we can. Now to go and hand wash the kid’s school clothes and our work clothes – because we have no power. Fingers crossed they will dry by tomorrow. It’s an incredibly stormy and gusty day, with flooding far and wide. Happy Birthday dear baby blog. 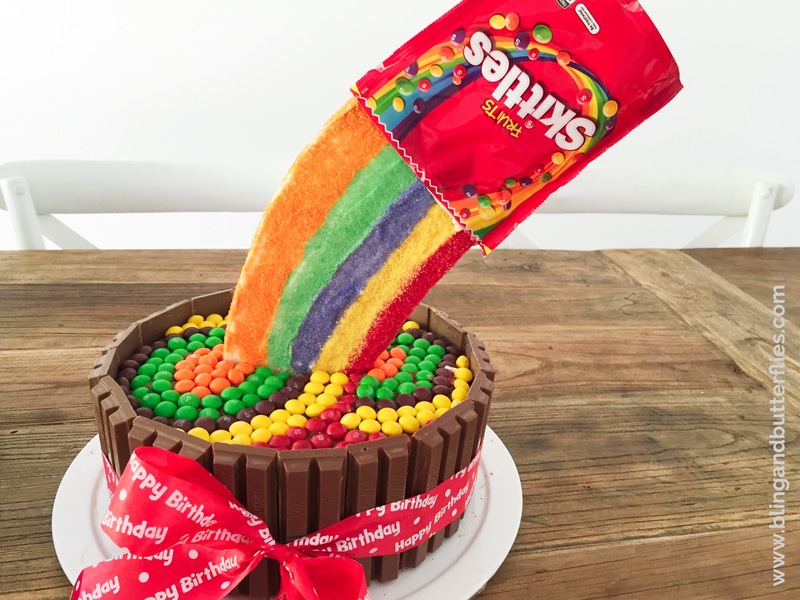 My daughter loves watching YouTube and we’ve come across that skittles cake and love watching that video! Happy blog-birthday! For an old time blogger like me (6 years and counting), it’s great to read what newbies write about. Congrats!